First off I need to touch on what got us to attending Augusta. Last year after Casey's return from Augusta she had mentioned that it might be a good fit for my Kasey. Especially since there are more young people there versus our local jams. That got things started. So over the course of the winter I did some research and read up on it to try to get some understanding about this event. Since Kasey definitely wouldn't do this by herself that meant I needed to be going. So I thought it would be best for me to take the bass course and her to do the banjo stuff. This would allow her to start to separate herself from me a little. What you have to understand is that it's a little nerve racking especially since we both have been under the wings of our banjo and bass bosses. (Murphy and Casey) When things go wrong they're always there to bail us out and mostly in a kind way! Unless you're me and you play Fireball Mail when you're not supposed to! Once we arrived at the Davis & Elkins College and got checked into the dorms, we had a orientation meeting with the staff. 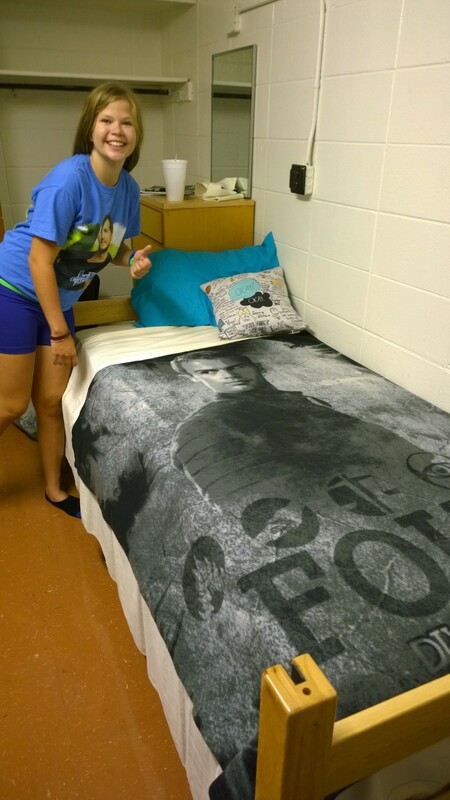 The stay in the dorms was fine and the bathrooms and showers were really kept clean. Also the food at the cafeteria was excellent and a very good variety all week. 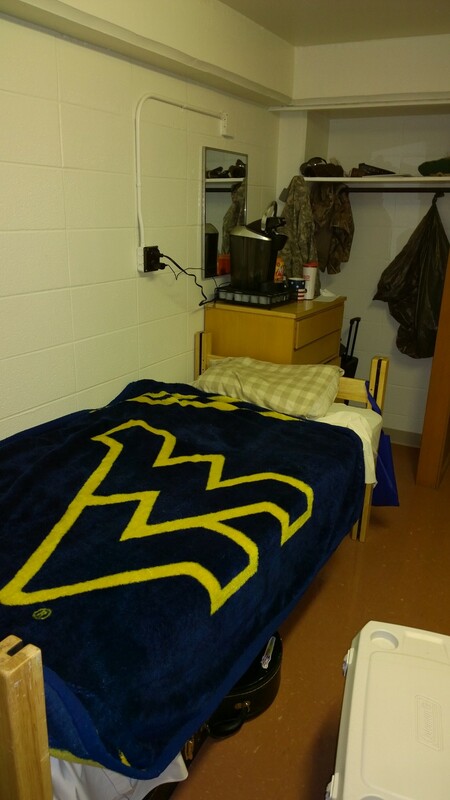 Ben's side of the room. Kasey's side of the room. Monday we started our week with instruction by our instructors. Mine was Mike Fleming for the bass and Kasey's was Ned Luberecki in the advanced banjo class. After the first day we decided to move Kasey down to the intermediate class with Richard Bailey. Ned was great but it was a little much for Kasey. Richard's class still had tab in it but the folks in the class helped her as she went along. So she came away with an understanding of what tab is and some new licks. 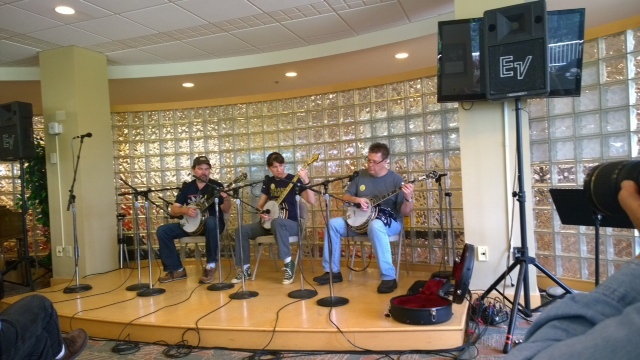 Richard Bailey, Casey Henry, Ned Luberecki at Wednesday's roundup. Me? Well my bass class was great. Mike Fleming was super and mixed it up quite well. Same thing happened to me with the tab sheets. I was totally lost. But by the end of the week I had an understanding of it. I came home with a whole new way of looking at the bass. The class was well worth the money spent. Just so ya know, I can see where knowing some tab is a good thing from the point of knowing the neck of my Bass in a visual format so I can relate to it to help me play. [Hope that reading all that tab didn't hurt your playing!] The way they did the day structure was perfect. Classes in the morning, lunch, then a roundup at 1:00 every day which was basically an instructional period of different themes each day. Then you were given an hour for practice time and then your afternoon class with your instructors. Then was supper and afterwards was your concerts or jamming on the porch or in the park in Elkins followed by a couple of evenings of square dancing at the dance pavilion. This was a well- rounded format that kept you from getting burned out. The concerts by the staff and instructors and guests as well as the SteelDrivers were exceptional! They were very rewarding for me and my Kasey. It seems that she really likes the newer style bluegrass like the SteelDrivers and since the future depends on the younger generation as long as they're listening and picking that's gonna be what matters. 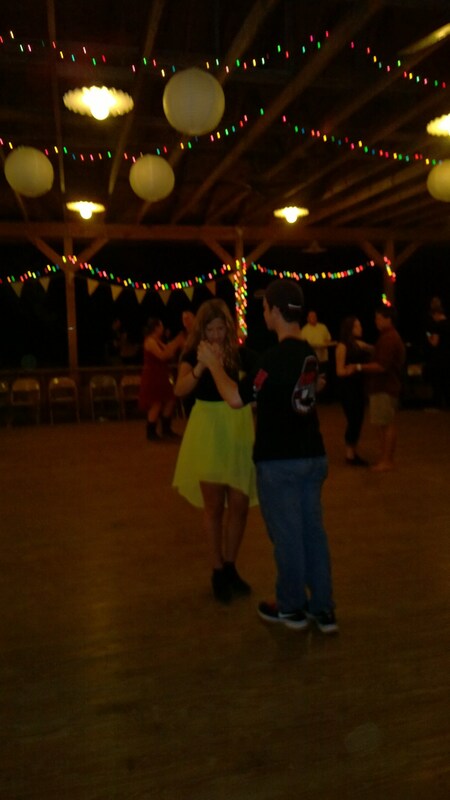 Kasey at the dance, waltzing. The other fun and rewarding part for Kasey were the square dances. At first she was like a bull in a china closet. GRUMPY! But once she got out there and started dancing she realized how much fun it really is. I'd have to say that I enjoyed it as well and would like to credit Casey for helping the both of us overcome our inabilities. Brave woman! I will finish with this. It takes a lot for me to leave home for a week and then say I'd do it again. I asked Kasey and she said the same. That's a pretty impressive answer since she was with her Dad all week. The Augusta experience was excellent. As a Dad, being with my daughter, grumpy or not, was super. So if any of you are considering going to Augusta, don't hesitate. You will meet folks from all over and be dazzled by some of the greatest instrumentalists in the world. You'll definitely come away satisfied and will have a new look at your personal instruments and your overall view of the bluegrass arena. I hope I enlightened you enough to want to attend this well-run event. God willing, me & Kasey will be back. Good writing/review Ben. You almost have me talked into going…….